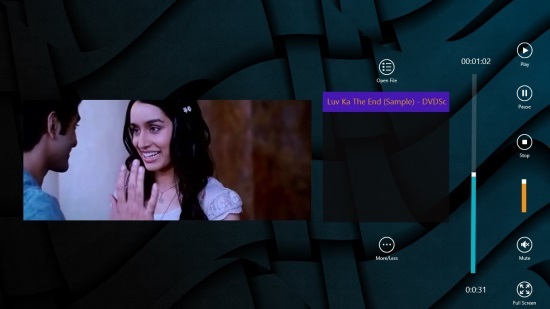 V2PLAY is a free Windows 8 Media Player that lets you play various types of audios and videos on your Windows 8 PC. Using this free media player, you can open any audio or video files available on your Windows 8 system, and play them. You can also create playlists to enjoy back to back songs. V2PLAY is a simple, functional, and lightweight media player. Packed with almost all common features of a media player, V2PLAY is capable of playing almost all popular media file formats like mp3, aac, mp2, adt, m4a, adts, and wav. The interface of the media player is simple and easy to use. V2PLAY media player is freely available in Music & Video category of Windows Store. You can search for it in Windows Store using the Win+Q key combination. To view the media player directly in Windows Store, click on the link given at the end. Let’s have a look at various buttons of the media player. More/ Less Button – As you click on it, Previous and Next button to play the previous or next song/ video in the selection, and Rewind and Fast Forward button will appear. Let’s see how this free Windows 8 media player works. Playing audio or video files with V2PLAY is pretty much easy. Choose your song(s)/ video(s) or create a playlist using Open File button given on the main screen of the media player. The list of selected song(s)/ video(s) will be displayed on the right side of the screen, with all functional buttons. In case you play a video file, the video screen will appear on the left side. Press Play button to play the desired song/ video. You can adjust volume using Volume Slider. Click on More/ Less button to obtain Previous and Next button, and Rewind and Fast Forward button. Use Previous or Next button to switch to previous or next song/ video. If you want to watch a video on full screen, press Full Screen button given at the bottom right of the main screen to switch to full screen mode. Similar Apps: Windows Player Pro and Multimedia 8. V2PLAY is a nice free Windows 8 media player that can play audio and video files in almost all common file formats. You can also switch to Full Screen mode to watch a video on full screen. You might not find the interface very attractive but yet its easy to use. Try it and share your feedback via comments.